When your currency pair reaches your desired rate, we will send you an email alert. 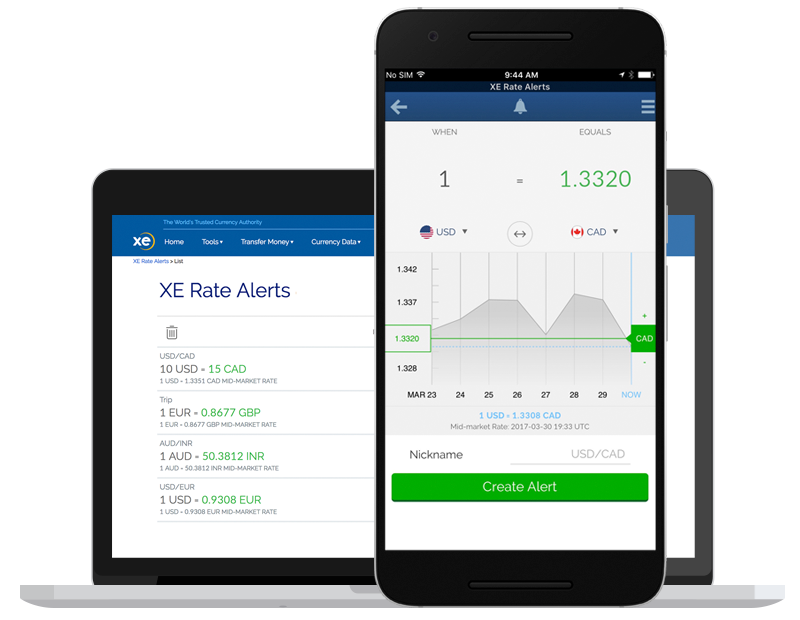 Download our XE Currency app to receive alerts on your phone. XE Rate Alerts use midmarket rates. The mid-market rate is the halfway point between demand and supply for a particular currency, which means it could and does change all the time. Need to send a money transfer and want to make sure you get the best rate possible? XE can help! Sign up or log in to learn more about our money transfer product and to set a transactional rate alert. Our rates are determined using live foreign exchange markets. When these markets are open, the rate you are offered will fluctuate right up until the moment you confirm your transaction. Your rate is only fixed at the point you confirm your transaction. When markets are closed (for example the weekend), the rate you are offered won't fluctuate - it will have been determined using the last available rates. If you don't have the XE App yet, download it now. View a complete list of OS we support here.